Euoplocephalus is known as the armor herbivore which was hard to be attacked by the predator. Euoplocephalus had the thick thorn around its armor, and it also had a plummet tail which could swing to hit the predator. All these weapons made Euoplocephalus hard to be killed, but the nature always has the way to control the number of animals. Most of Euoplocephalus’ weight was the bone weight. 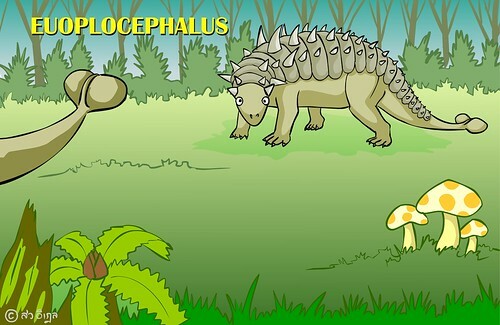 This means Euoplocephalus had to take longer time to grow up comparing with other dinosaurs. Roll mouse over the dinosaur, you will see the information. Roll mouse over the tail, you will see how it swings and breaks your desktop.